“Give me the same thing, only different” is an old Hollywood adage. 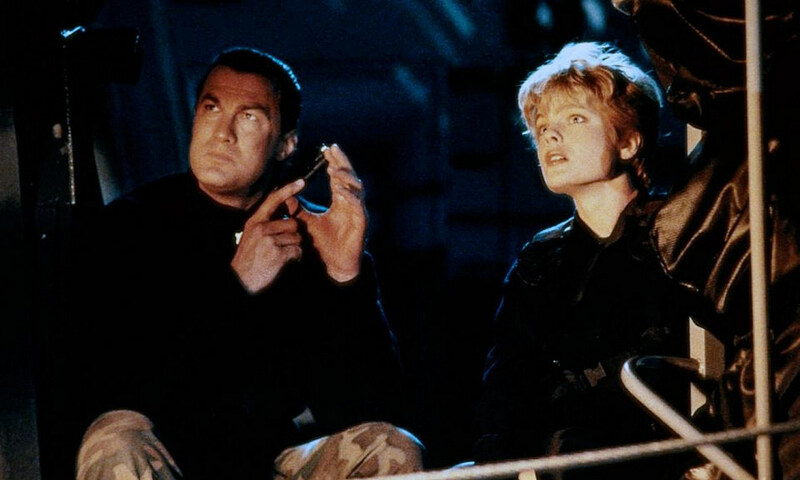 Under Siege, the Steven Seagal action-thriller set aboard a Navy battleship that turns 25 this week, took the by-then-well-established “Die Hard formula” and followed it step by step — except for one massive change. It gets rid of the everyman hero in an unfamiliar environment who stands little chance of success, and replaces him with an invincible beast in an environment perfectly suited to his abilities who stands little chance ... of failure. A group of [bad guys] take over an [enclosed space] and take [people] hostage while they steal [something]. But one [ordinary guy] avoids capture, sneaks around, kills the bad guys, and saves the day. A group of mercenaries take over a U.S. Navy battleship and take the crew hostage while they steal nuclear missiles. But one lowly cook avoids capture, sneaks around, kills the bad guys and saves the day. Except he’s not just a cook, he’s a former Navy SEAL. It may sound good, but making the hero a level-10 badass weakens the character and the viewing experience. How is there supposed to be any suspense if the hero can just walk from room to room killing everyone in sight without suffering so much as a scratch on the arm? It dumps the fish-out-of-water element from Die Hard (lone New York cop trapped in L.A. office tower against a dozen highly-armed professional terrorists) and replaces it with the ultimate fish-IN-water story. That’s not how you’re supposed to do it! Let’s back up for a moment. Despite the fact that its main character is an unstoppable ninja warrior who makes the villains look like scrappy underdogs, thereby undermining any chance of actual dramatic tension, Under Siege does still work. It’s a fun, fast-moving flick with lots going for it, so we should acknowledge those parts as well. First of all, the cast. This has to be Seagal’s best work. He even smiles in this one, something I can’t remember him doing much of if at all during the run of grammatically-similar three-worded action flicks that started his career (Above the Law, Hard to Kill, Marked for Death, Out for Justice). 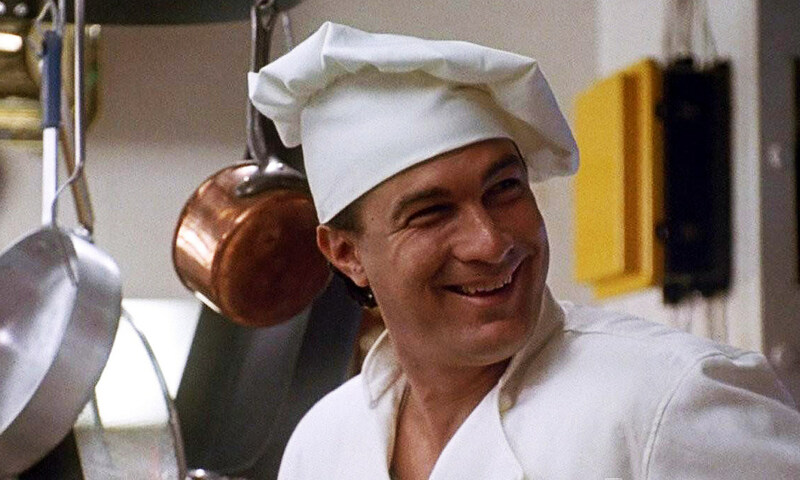 At the start Seagal, as self-described "lowly cook" Casey Ryback, is charming and cool and laid-back, joking around with his kitchen pals, tossing off casual one-liners. (He never gets anything quite as good as “Yippee-ki-yay, motherf —er,” though.) He seems to actually be having fun in Under Siege, something he hadn’t allowed himself to do previously. And, of course, he handles all the fighting and punching and shooting, but that was to be expected. The movie also does a great job utilizing its setting. We get glorious wide shots of the gigantic battleship cruising across the vast, open sea at the start, and some thrillingly-choreographed, close-up hand-to-hand combat inside the extremely tight quarters below decks once the action kicks in. Those scenes create and sustain a sense of claustrophobia and pressure all the way through. There’s some great stunt work too, numerous well-executed explosions, and the pacing never flags. Andrew Davis’s next directing job was an even bigger success, 1993’s The Fugitive, and while he never quite reached those heights again, Under Siege and The Fugitive would make a standout double feature on anyone’s resume. Also amusing is how directly Under Siege lifts from Die Hard at times, whether intentionally or not. Early on, its dark-haired lead villain, Stranix, murders the highest-ranking officer in the room by shooting him in the head, to establish how serious he is. This recalls how his Die Hard counterpart, the dark-haired Hans Gruber (Alan Rickman) murders the highest-ranking Nakatomi officer, the CEO, Takagi — also with a bullet to the head. Both Stranix and Gruber have blond-haired second-in-commands who die near the top of Act Three (or “die,” in Karl’s case). Both sets of bad guys feature a bespectacled tech guy who spends most of his time in front of assorted computer screens aiding the theft process and helping to fend off external attacks. I guess they’d call that an homage, right? Clearly the creators of Under Siege were following the Die Hard formula, but it’s a shame they didn’t realize that all Under Siege ever had to be was “Die Hard on a boat.” The setting alone, a Navy battleship, satisfies the “only different” part of the old adage — it never needed to make Casey Ryback a secret Navy SEAL. In fact, wouldn’t the movie have been better if he really was just a cook? This being a Steven Seagal movie, maybe he’s a cook with a bit of martial arts training, sure. Nothing wrong with that. Think of all the dangers there are in a ship’s galley. Couldn’t a clever screenwriter and director find ways to make this cook do some seriously badass stuff? Imagine if Ryback had to use the various skills he learned in the kitchen to survive the night. He could still hurl those huge knives at bad guys’ throats, right? He could also knock one into a giant pot of boiling stew, maybe lure another into the oven and trap him there, or whip up some concoction, put it in the microwave and use it as a detonator just as someone walks past. (Under Siege, to its credit, actually did use that last idea.) Beyond that, it would amp up the suspense a ton if it felt like this cook might actually get killed at any moment, that he really is overmatched and must rely on his bravery and ingenuity to save the day (and himself). That’s what John McClane had to do. There’s a scene in Die Hard where McClane sits on a bathroom sink pulling shards of glass out of his bloody feet. While he does that, he chats via CB communicator with his buddy outside, pouring his heart out about how he regrets never telling his wife “I’m sorry.” McClane doesn’t expect to make it out of Nakatomi Plaza alive, and he’s saying his goodbyes. Casey Ryback, on the other hand, never breaks a sweat, never musses his hair, never loses control of the situation. He never has a moment of fear or self-doubt, like McClane did on that sink. And if he isn’t scared of these bad guys, why should we be? In the final knife fight between Stranix and Ryback, not for one second does Stranix stand a chance. Over in Die Hard, though, the bad guys repeatedly kick the s— out of John McClane, most memorably the terrifying Karl. But Ryback is plainly better at everything than these bozos. In Die Hard, McClane has to figure out how to avoid getting killed by the bad guys. In Under Siege, it’s the bad guys who should be worried about their survival. The one time Ryback does suffer a serious wound — someone gashes him with a grappling hook, a particularly impressive feat considering 10 other guys standing next to him unload several hundred rounds that all somehow miss the mark — he’s somehow fully recovered by the next scene, and we never hear about it again. So not only is this guy a Navy SEAL, apparently he also has Wolverine’s healing factor. 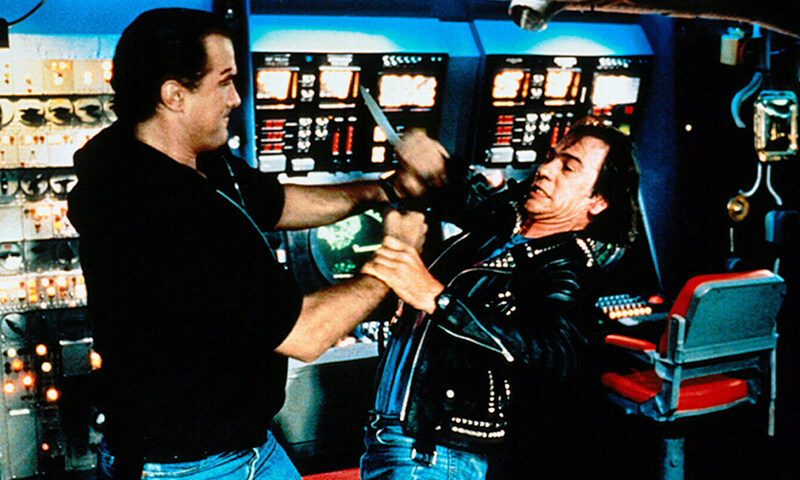 Under Siege isn’t the best Die Hard clone, but it’s close. It’s not the undiluted, start-to-finish adrenaline rush of Speed (“Die Hard on a Bus”), but it’s several notches above the rest of its contemporaries, like Passenger 57 (“Die Hard on a Plane”), Sudden Death (“Die Hard in a Hockey Rink”) or Toy Soldiers (“Die Hard in a Boarding School”), not to mention all the far-worse rip-offs. It tops all those Die Hard clones despite failing to heed maybe the most important lesson of the Die Hard formula, that the hero needs to be an ordinary guy. It succeeds thanks to a winning cast, rousing action scenes and obvious affection for what you might call its source material (stretching perhaps into outright plagiarism at times, but that’s forgiven). Director Andrew Davis and screenwriter J.P. Lawton, like many who came before, were tasked with giving the audience “the same thing, only different.” And they did: Under Siege is a great Die Hard movie. But it could have been a better Die Hard movie, if it they had just let Ryback be a lowly cook.